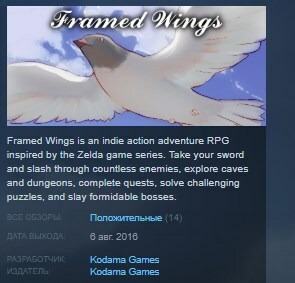 Framed Wings is an indie action adventure RPG that takes inspiration from the Zelda game series with heavy focus on combat, exploration, dungeons, puzzles, and questing. You play as a hero on a quest to uncover the truth about a missing friend. During your travels news comes to light of a group of magicians that have stolen an ancient grimoire from deep within the School of Magic. The grimoire is rumoured to have the power to unlock a sealed door hidden somewhere on the island which imprisons a foe with catastrophic capabilities. Prepare yourself for hours of fun as you take on dungeons, solve puzzles, complete quests, and slay formidable bosses.